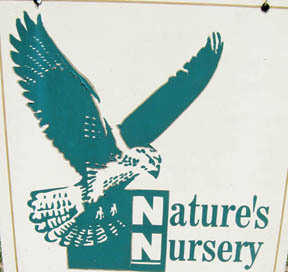 Nature's Nursery Center for Wildlife Rehabilitation and Conservation Education is a non-profit organization dedicated to rehabbing injured and orphaned wildlife, and educating the public through their nature programs. Since 1989, their mission has been to improve the well-being of local wildlife populations and habitat through education and rehabilitation. Nature's Nursery works with most species of wildlife that are native to Ohio, and those who can't be released back into the wild are often used in their educational programs. The folks at the Nursery are a wonderful bunch of people who work hard to save every animal that they possibly can. Since rehabbing critters costs money, please click here to make a donation, and be sure to visit my Critter Pics page to check out photos of some of the Nursery's residents."